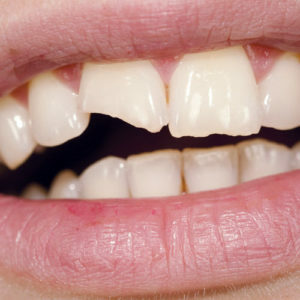 If I have a chipped tooth or broken tooth, what do I do? We may be able to see you that same day to repair your chipped tooth, but contact us first so we can schedule you in as soon as possible. What are the options to repair the chipped tooth? We use these temporary fillings at the initial appointment. We make them to last a day to a few weeks before requiring a more permanent fix. This filling is made of Glass Ionomer. It is a placeholder for the permanent filling. We do not use glue to hold it in. Although these will not last for the rest of a patient’s life, they are a far more long-lasting fix than the temporary filling. We bond the filling, made of Composite Resin, to the tooth. If too much of the tooth is missing, a filling will not have enough tooth to hold on to. A Dental Crown will be required instead. What if I am able to find the piece that chipped off? Even if you are able to find the piece that broke off, in most cases, we will not be able to use the piece of the tooth in the repair process. If this piece is found, it can be saved and brought in as a potential option. However, do not worry about searching for the chipped piece(s). What if my entire tooth falls out? The loss of an entire tooth requires an immediate appointment. The longer the tooth is out of the socket, the less likely we will be able to replace it in the socket. Contact us immediately for an appointment.